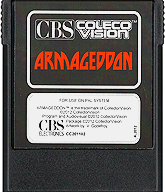 ColecoVision.dk presents: Armageddon © 2011 by: CollectorVision Games. 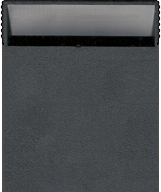 ColecoVision Cartridge #, Casing and Producent: 4L2012 / CC201102, Standard Black U.S. Style, Moldex Canada. Aliens from the planet of Krytlov have begun an attack on the planet Zondar. The Krytlovians are warriors out to destroy and seize the planet of Zondar. Zondar is the last of the peaceful planets. The Zondarians are skillful and hardworking people. Their cities are built-up and rich in resources. It is truly a planet void of crime and violence. Zondar has built a powerful defense system. Several antiballistic missile bases have been established within the cities of Zondar. The Zondarians are ready for this attack, and are prepared to fight to save their cities. As base commander it is your responsibility to protect and defend six cities on the planet of Zondar. The Krytlovians have begun firing interplanetary ballistic missiles. They are aiming at your cities and missile bases. Your only defense is to fire back with antiballistic missiles. But watch out, the Krytlovians are sly. They also have multiple head missiles, smart bombs, airplanes and satellites. High Score For The ColecoVision Version Of: Armageddon. 1st XScore: 1st XScore: 1st XScore: 2.645 - November 29, 2014. XName: Name: Name: Ole Nielsen. 2nd XScore: 2nd XScore: 2nd XScore: 1.205 - July 22, 2013. ColecoVision.dk Game # 93, Armageddon is last updated: March 23, 2019.